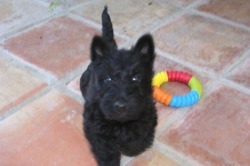 Culton's Scottish Terriers - Culton`s Scottish Terriers AKC Scottish Terriers. Raised with Love in a family setting. 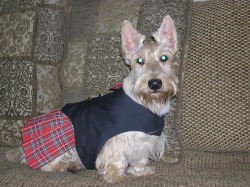 ​ Welcome to Culton`s Scottish Terriers. My name is Lainie Culton MathCall 951-537-7875 or email jasonlainie1@aol.com for availability . IF YOU ARE USING BREEDERS.NET TO CONTACT ME, You will have to MANUALLY TYPE IN MY EMAIL ADDRESS. THE LINK FROM BREEDERS.NET IS NOT WORKING! I am located in SOUTHERN CALIFORNIA. NO rescues available at this time. I get them in occasionally. If you would like to be placed on that list, please email me. I have a team of ppl who help with rescue. Are you ready to take on a new puppy, or a rescue dog? Before taking in a new puppy or a rescue there are a few things one should ask themselves. Do I have a secure area for my dog? If I have a pool is it secure? Do I have 10-15 years to dedicate to a new family member? Am I willing to dedicate time to puppy classes? Will I be able to find petsitters to sit with my dogs if I need to leave him/her for any length of time. Is this the type of breed that will work with my family ? Will I be able to afford to care for this breed in the way it needs to be cared for. Will I be able to afford a significant vet bill if my dog gets sick? Will this breed get along with my children and other family members? IS this purchase OK with my other family members? 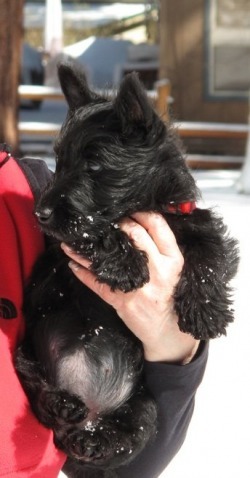 If this is your first puppy, or you have not had a puppy/dog in years, you will want to find a groomer( You will want to be aware that your scottie will need a grooming every 4 to 6 weeks) , Vet and a puppy class. Possibly a dog trainer. 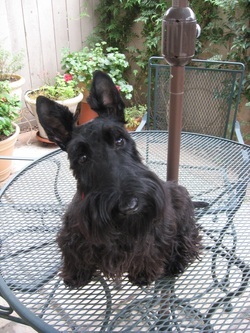 If you have not had a Scottie and would like to get to know abit more about the breed, you should order a Subscription for Great Scotts magazine. 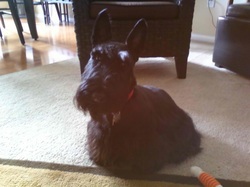 It has great articles about the breed, health issues, ect..Please be aware that when inquiring on a rescue-- it is a rare occurance when a Perfect scottie is placed for rescue. This is the vWD Certificate for my male Spirited King Deveron. AKA :: PHillip and our female Maggie. All pedigrees can be seen online. Send me an email and I can send you the link. This is a Proper vWD certificate done by VetGen.com . ALL breeders should have their dogs tested for vWD. 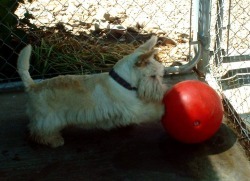 If the breeder does not know about vWD, MOVE ON! This test is not done on puppies. Cost is $180. It is done on the breeding dogs. This is posted here for your benefit. You now know what they look like when properly done. This is not a test done on pups After birth. After birth is to late! Because Phillip has been tested as clear-- NONE of his pups can have this disease. I breed him to vWD CLEAR females ONLY! This DNA test is for the mutation typically found to cause the disease in this breed. for helpful information regarding this type of test result. I have also posted Maggies vWD clear Cert. YES !! I do rescue !! I am NOT associated with the STCA,or their rescue org. I do rescue out of my home because I love the breed!! You can now see two of our puppies- Amber and Dash in the new Coffee Table Book : ROVER The WOOF edition ( Shown on Ellen and Oprah ) . Thank you Yvette Harris for Adding Amber and Dash to ROVER. If you are interested in ordering a copy of ROVER I have added the link below. 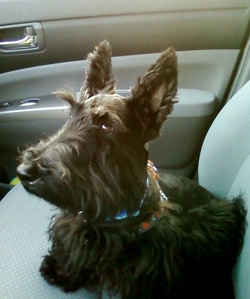 To date some of our most popular Scottie names are Maggie, Angus, Mackenzie, McDuff and Wallace. We are now starting to get Phins and Finns. My favorite of all the names I have come across so far is Biscotti. Least creative name so far-- Scott! I will be adding more pictures as I re-work this web site. If you have any questions about how the Scotties or the pups, please send me an email to jasonlainie1@aol.com , or call 951-537-7875 References available. You will not find puppy for sale info on this site. You must email and fill out application . Pictures , info ect will be sent to serious inquires ONLY.. If you are looking for a Cheap Dog, back yard dog or a gift for someone else---PLEASE GO TO ANOTHER BREEDER. Below--Gwyneth Anne, Bogey and Buddy , Wallace , Mollie, Wallace, Sonny, Piper,Brodie, Tessa, Trixie and Abby..
More pictures of our babies all grown up. You can see by looking at all of them that I have a certain look I am breeding for. I have been able to Maintain this conformation for years now . I like to combine the Show lines with the pet lines. This gives pups a more loving temperament with the proper conformation. Sorry the pictures are small. I have no idea how to adjust size. MORE picts can be sent via email. About My dogs. This is how I screen a breeder. I follow how i would raise a puppy and how I have done so in the past. My main concern in my breeding program is to EDUCATE YOU THE BUYER NOT TO MAKE MONEY ON PUPS. I am not a big puppy producer! As some might like to spread or think. In 2009 I had 7 pups. 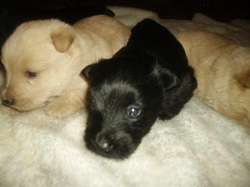 2010-- 3 pups. 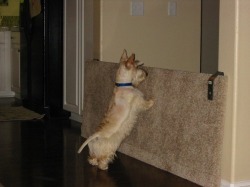 Durring 2010-- I took in 7 RESCUE DOGS!! NONE of which I produced. I do not produce pups to find buyers. I find buyers first --then I produce pups. NO pup is unsold at time of birth! All are sold to the waiting list or previous clients. When you inquire on a puppy you will not just get a bland to the point answer. You are going to get educated on what I have, sire , dam, lines, health, pedigree, food, ect...The Job of the breeder should not be to sell puppies but instead should be to educate people about the breed its self and the lines they are breeding. I breed also for GREAT HEALTH. I do required health screens. PLUS I research diseases related to my breed. I do CA risk calculations BEFORE breeding my dogs. 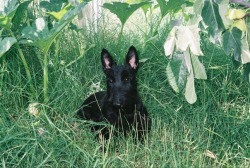 I Also breed for correct conformation, This is height, weight, tail , length, ear set, ect..You will not ask for a Scottie here and end up with something that ends up looking like a wire haired Dachshund, or something with out a scottie coat. 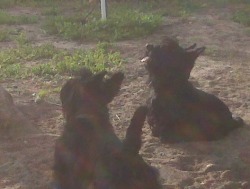 Scotties have straigh tails. This short tail gives the apperance of a small stubby carrot. The scottie tail is NEVER suppose to be long and curl! To get proper conformation I have AKC Champion sired breeding dogs.When I say AKC CH lines-- I mean the parents to MY personal breeding dogs are AKC CH.. You will not find AKC CH in the 5th line back and me calling them AKC CH lined. 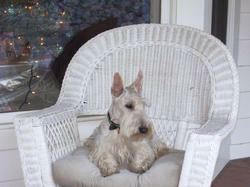 My dogs are of AKC CH lineage but I do not show dogs, However they do meet AKC standards and could very well be shown. 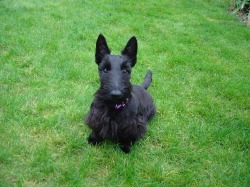 I DO NOT sell my Scotties to Show home unless you will enter a very strict contract. I prefer pet homes NO AKC paperwork will be sent until all pups are verified as neutered or spayed. . I perfer homes where LOVE is given 100% of the time.. All puppies are to be placed with a spay/neuter contract- they will go to their new homes with LIMITED AKC ONLY-NO BREEDING!!! . NO FULL AKC TO PET DOGS.--do not write me a story and try to get full AKC with out co-owner., NOT happening. I only sell Full to responsible breeders who have breed this breed for DECADES!!! The breeders I sell to MUST have CA and vWD free and clear stock! in other words-- I MUST KNOW YOU TO GET FULL AKC!!! .I do on occasion do stud service ) .. In order to get stud service the female inquiring must be the quality of my stud. He is AKC AM/AUS CH sired. . 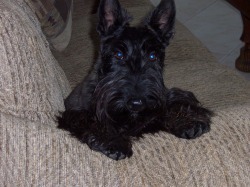 This is not a breeding facility or a puppy mill, we raise all scottie including adults in OUR HOME>> They have free run of our house. Which means just that FREE RUN! 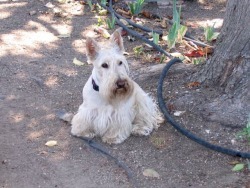 All of our Scotties are vWD clear. I have also run the risk factors for CA. I am running a CA CLEAR breeding program at this point.! To find out more info on CA go to the STCA web site. You can research this disease on that site. Make yourself aware of this. You can run pedigrees of prospective pups through this Risk Calculator, as I have had done. 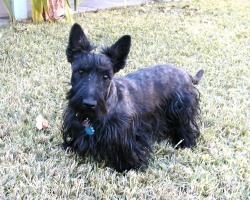 Before you buy a Scottie please educate yourself on the breed. 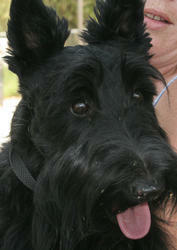 This breed has Scottie Cramp, Liver problems,CMO, Epilepsy and the two diseases mentioned above. 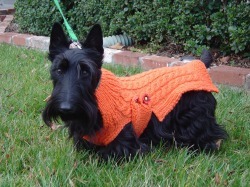 A good breeder will know about ALL of the scottie diseases and will make sure the purchaser is educated before the sale is made. If your seller is only concerned with telling you price, BEWARE! 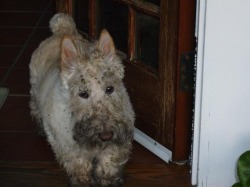 WHen Screening your potential breeder-- make sure they can spell Wheaten. If they spell it wheaton -- move on. They have made no intentions to get to know the breed other than to profit off of it. If you would like a rescue dog--PLEASE CONTACT ME AND I WILL SEND YOU ANY INFO I HAVE!!! On occasion I do get them here, I retrain them, potty train them , then send them to a SCREENED pet home. I will spay and neuter if they need it. I also do vet testing to see if this dog is healthy, ect..I DO NOT RESELL RESCUES> But on occasion i do ask for a dontaion based on what I have put into the dog via, vet services, training and grooming! NO RESCUES PLACED FOR BREEDING PURPOSES! I do not use vitamins, Instead of a vitamin , I give an immune System builder. All puppies have immunity passed though to them via mom. This natural immunity starts to fade at 7-8 weeks of age. This is why we give shots at 8 weeks. Since the natural immunity is still in the pup, you never know if this shot took. This is why boosters are given at 11/14/17 weeks of age. The immune System builder helps the dogs build a natural immunity to disease. It helps them take in the shots easier then one who has a weakened immune system. I use http://www.nuvet.com. The new customer order code is 74290. ALL animals need supplements just like people!! All puppies are started on potty training. Over the past few years I have decided to start puppies on potty training.I felt that if I was reading the newspaper and getting massive amounts of ink on me, what are the puppies getting on them. You can see on a wheaten that the fur turns grey. You have to wash them several times before the print comes out of the coat fully! I looked at this and said to myself-- What are the long term affects of Newsprint? So I decided to use Potty grass. 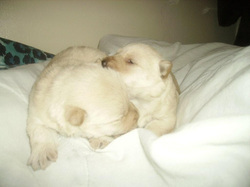 It is cleaner and more nautral to the puppies. They get no ink on them at all! This has to be a plus in the health department! I start potty training with a device called Potty Patch. You can google that to see how it works. I buy mine for $40 at WalGreenes Drug Store . You can also google them to find them online and see the video on how they work. I start the puppies on this training at 3 weeks of age. Right when they start to walk. They then use this the whole time they are with me.By the time they leave they are opened up to my entire kitchen and use potty patch. I NEVER PUT MY PUPS OUTSIDE while with me. I suggest you not put them out until ALL SHOTS Series have been given (16 to 20 weeks). They will use potty patch and have no accidents. They will then transition EASILY to the grass because this is what they have been going on since 3 weeks of age. I do not place puppies with families from 6 to 9 weeks. I like to keep them from 10 to 12 weeks. This helps puppies learn to socialize with the older dogs and they get over the nautral fear period all dog breeds go through. This happens from 8 to 10 weeks in age.Placing a pup of any breed at 6 weeks of age is WAY to early. They do not get to learn dog behavior from their Pack members, they learn human behaviors... These are NOT HUMANS! 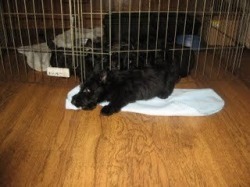 Puppies are then started on Crate Training at 8 weeks of age. By time of placement at 10 to 12 weeks they can stay in crate for about 2 hours. NO LONGER! If you would like more info please EMAIL --LAINIE at jasonlainie1@aol.com or call -951-292-1296. Please leave a message. Please know it is easier to reach me via email at jasonlainie1@aol.com. I am located in Southern California . I do not ship. 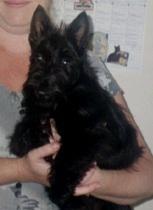 All buyers must come to our home and meet the Scottie's. Links,, These are to OTHER WEB SITES that I list my web site on.. Dogs seen above are Another Maggie, Angus and Mac.Dogs below are Malcolm, Duffy, My male Phillip. MacDuff, Sunny and Kelly. The goal of ALL breeders of ALL breeds is to CONSTANTLY perfect their stock. NO true breeder is ever happy with their health or conformation. A true breeder is constantly looking to IMPROVE on what they have.. 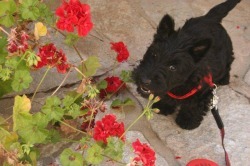 If you are another Scottie breeder and you don`t like this site--PLEASE ASK YOURSELF WHY??? Info regarding health is on the STCA web site for the General Public to look at. I am just restating it.